Save up to 40% by dealing directly with Carers. Comprehensive support and emergency back up. Contact your chosen Carer through the platform and agree rates, hours and tasks. Manage schedule and securely pay your Carer - right here - through the platform. The companion apps allows both customers and carers to manage their contracts, shifts and facilities within the Home Care Direct platform. Search Ireland's largest online home care community to find a Carer that lives in your area, has the experience and personality that suits you and then connect directly with them here. Why use Home Care Direct? Up to 40% better value! Fill in our online questionnaire, attend an interview and create your own profile. People and families looking for care will contact you directly to agree arrangements that suit both of you. 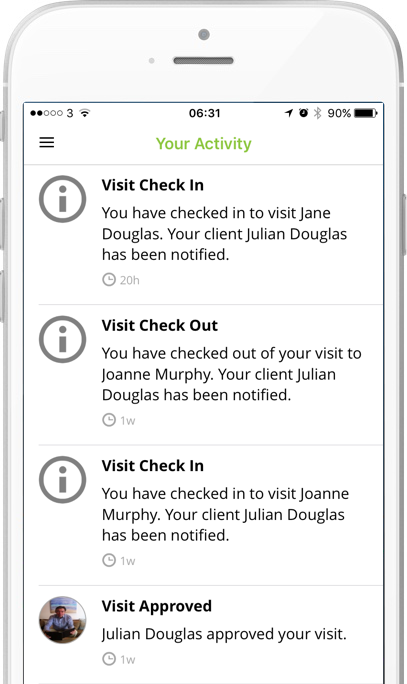 Keep track of your clients, your rosters and your payments and after each visit you will be paid directly into your bank account.